Welcome to the GigajamVLE Theory course. You don't need to study this add-on course to excel in your selected instrument, but if you wish to know more about the underlying musical theory and develop your skills further then please do so. This lesson covers: notes on the musical stave, ledger lines, treble and bass clefs, the use of bars and time signatures, how to read; whole, half, quarter, eighth, and sixteenth notes and rests, ties and dots in developing rhythm. 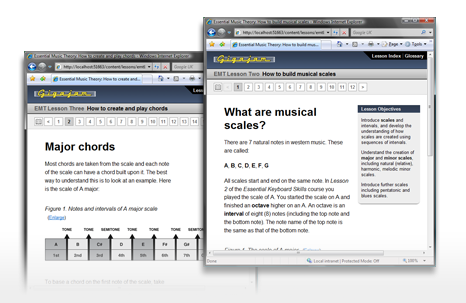 This lesson covers: how scales are created using sequences of intervals, major and minor scales, including natural (relative), harmonic, melodic minor scales as well as pentatonic and blues scales. This lesson covers: simple chords using triads, how to build major and minor chords using scales, the formation of diminished, augmented, 7th, minor and major 7th chords, Sus4 and Sus2 chords. This lesson covers: musical keys, recognising all major and minor key signatures, the cycle of fifths and cycle of fourths, the concept of relative major and minor keys.